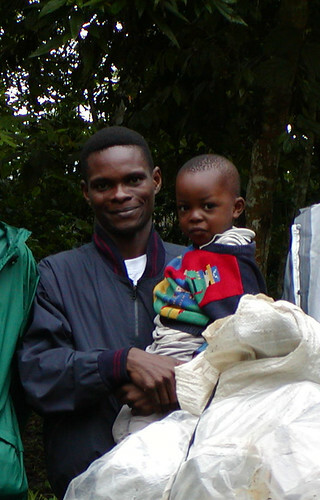 Corneille and his son in the Ituri Forest. 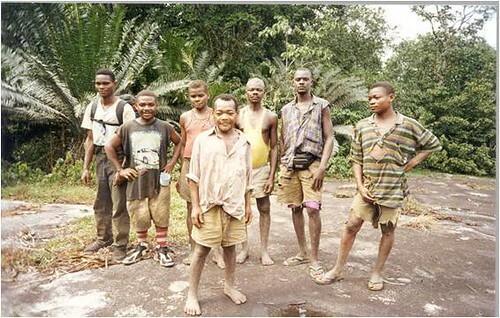 Corneille, on the far left, with a team of botanical assistants (Pygmies and villagers) on an inselberg in the Ituri Forest. I was 14 years old when I went elephant hunting for the first time with my uncle. This was during the boom in ivory prices in the early 80s. We hunted mainly inside the Salonga National Park (west of TL2). 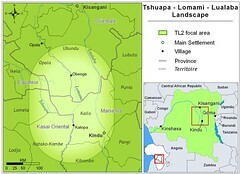 My ethnic group, the Libinza , are renowned hunters and, alas, were one of main groups to decimate the Park’s elephants. My uncles were traditionally fishermen or hunters of monkeys and some large mammals including buffalo, bongo and hippopotamus. But when the price of ivory went up, they could make a lot of money as elephant poachers. We traveled first by dugout and then on foot to get to the forest inside the park where there were lots of elephants. We went as a team of seven to ten people including two or three women. The women prepared the food, but were also responsible for the elephant meat. If the elephants were killed near enough to a camp on the river the women would cut up the meat and smoke it. If we had to hike too far to kill elephants then we would just cut out the heart and some other preferred meat like the trunk, the intestines and the foot pads. That would be our own food and not to sell – the rest of the meat was left to decay in the forest. Our group would have from three to five guns usually acquired from army officers who also provided lots of ammunition. In the 80s our country was a transit for guns to Savimbi (Angola). Lots of guns leaked into the Army and there were lots of Libinza people (my tribe) among the army officers; so it was easy to get AK47s. We were more heavily armed than park rangers and they knew it. In our tradition a man has to show that he can protect his family. We do that by killing a large animal. If we kill the most fearsome, an elephant or leopard, then there is a special traditional ceremony. During the ceremony we wear the leopard skin or the tail hairs of the elephant. I had my elephant tail. By killing an elephant I gained the right to join the traditional warrior clan. It was a sign of maturity and strength and particularly for a young boy like me. But traditional reasons for killing elephants are becoming less and less important. Even then, my uncle killed elephants mainly to earn money. The hunts during the decade when I was involved were always successful. In fact, he made a lot of money from ivory, or what was a lot of money for our village. Thanks to elephant hunting with my uncle, I was able to afford university. To control elephant hunting we must get rid of the economic reward. Without buyers and good prices, there would be almost no elephant hunting and certainly not in parks. I remember in the late 80s when ivory trade was controlled, the demand fell, all poachers were discouraged and my uncles went back to fishing and other commerce. A fall in ivory price is desperately needed today to save the last elephants in our forests. 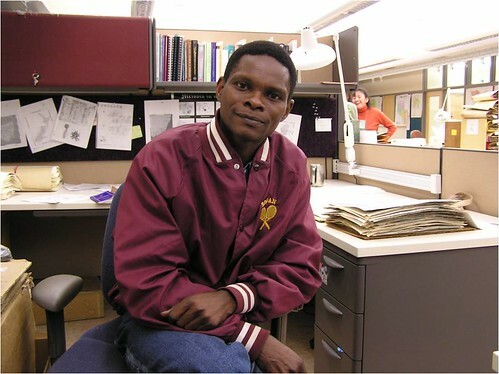 Corneille as a graduate student in the United States. He had a scholarship — clean money — for his graduate studies. He is now getting a PhD in Holland. This entry was written by Terese Hart, posted on 2009-02-13 at 11:08 pm, filed under Bushmeat, Elephant. Bookmark the permalink. Follow any comments here with the RSS feed for this post. Post a comment or leave a trackback: Trackback URL. Thank you for sharing Corneille’s story with us. May he go from strength to strength. Inspiring and enlightening story. Obviously there are great things yet to come from this young man.